To advance through Speed Mandarin, you go through Units. Each Unit contains Videos, Read-Ups (a.k.a. books), and Quiz-Ups (a.k.a. quizzes). To unlock the next unit(s), you need to pass the Quiz-Ups with a score of above 50%. Your score will be shown as a bar on the orange unit box. Our videos are created with the brain-friendly methods that we’ve researched and developed over the course of many years. For every character we teach, there is a method for you to remember (1) the pronunciation of the character, (2) the writing of the character, and the (3) meaning of the character. After you’ve finished each video, you can “Replay” the video because you need more help (or because the video is super cool). Otherwise, if you feel confident, you can hit “Next” and move on to the next video. Read-Ups are simply picture books that will drive what you’ve learned in the videos deep into your memory. Each Read-Up contains Mandarin sentences, and when you read these sentences, you would be amazed by the fact that you’re actually reading and understanding Mandarin! On the next page(s), we have put the English translation(s) below each Mandarin character so you can confirm that what you’ve read and understood is correct! You may spend as much as much time as you wish on the Read-Up. You can read it leisurely whilst sipping your tea, or read it in a rushed commute journey. It’s really up to you, and you can do it at your own comfortable pace. The Quiz-Up is the final chapter in a Unit. It is the key to unlocking the next Unit. Each Quiz-Up contains a multiple-choice question. Make your decision carefully before selecting your answer. After your answer is selected, your score will be logged. Each question is worth 1 point. If you select the wrong answer, an “X” will appear, indicating that it’s incorrect. You now have to find out which of the remaining choices are correct. After selecting the correct answer, you may move on to the next question. However, this scenario will earn you—0 points. Alas. To earn 1 point, you have to get the question right on the first try. To pass the Quiz-Up and unlock the next Unit, you need to score above 50%. After you’ve passed the Quiz-Up, let’s say with a 90%, you are most welcome to try again and get a 100%! It is good necessary to do some revision to brush up your memory. Feel free to access your previous Units to revise any part that you feel you need help with. We recommend you do revision once a day. Rewatch the videos if you feel you need to memorize it more firmly. Repeat until your memory is really, really firm. A few minutes a day really, really helps with your learning and memorisation, which consequently make the learning of subsequent units way easier! Purchasing a subscription unlocks unlimited access to all our content! For the precious Mandarin skill you pick up so easily within such a short amount of time, our pricing is super reasonable. And we’d also like to thank you very much for supporting us. It will truly enable us to produce future Units that are more advanced, even job-specific Units like engineering, medication, and business, that will come in handy for you, your family, and your friends! If by any chance you are not satisfied with what you paid for, we have a -day unconditional money-back guarantee. Just contact us and we’ll get right back to you on your refund. How much data do the videos use up? Our videos are in HD 720p, and they stream at a bitrate of 1 mbps, so basically for every 1 minute, 7.5 megabytes of data will be streamed. It’s basically Youtube HD 720p quality. Are the lessons done using Simplified Chinese or Traditional Chinese? We use Simplified Chinese, which is used in China and also worldwide. Traditional Chinese is mainly used in Taiwan. For now, it’s not possible to change your email on your own. Please contact us, and we’ll sort it out for you. Your videos seem to be geared towards younger people. Well, at first glance, you might think that our videos are geared towards younger people. But in fact, these videos are for adults as well. One of the reasons we do this is because of the mechanics behind brain-based principles. If you notice, kids learn things effortlessly, by observation and intuition. A 6-year-old learns how to sing Twinkle Twinkle Little Star from a stay-at-home mom singing whilst doing her work. Therefore, we want to incorporate this childlike ease and effortlessness into our program. 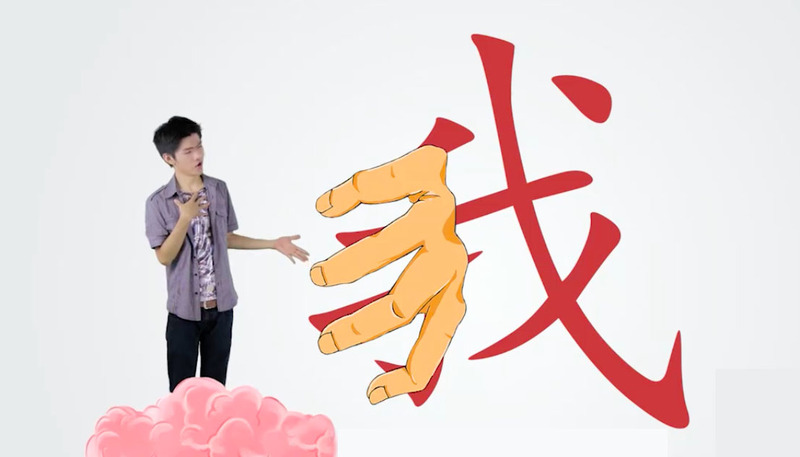 So, while our videos may be child-ish, one has to be childlike to achieve the maximum effortlessness and ease of learning Mandarin one of the hardest languages in the world that Chinese kids find the easiest. In the end, it’s about you picking up the priceless skill of Mandarin. Do your pictograms actually reflect on the actual meaning of the strokes? Sometimes, it takes up too much time to explain the actual and accurate meanings of the strokes, which ends up teaching non-relevant information. Seriously, do you want us to explain that the 苗 from 猫 (cat) means sprouts, and that the 田 from 苗 (sprouts) means field? Of course not. This is why we draw the 田 (field) into the likeness of a cat’s face with a big + for a Persian-catlike nose. Another fact is, Mandarin has been around for a really long time, which means that the original logic and reasoning behind the strokes of the character have been lost and muddled up. Therefore, it is really not that helpful and convenient to explain the original meaning, unless you are doing a course in Chinese etymology. However, it is convenient to explain the actual meaning at times, for example, the 王 from 玩 (play) actually does mean king, and we created the story so that the child plays with the king. Other times, it is simply better to say that 乙 from 吃 (eat) is a man’s stomach stuffed with sushi rather than “the second of the ten heavenly stems”. Oh dear. Looks like we’ve run out frequently-asked questions. Help us out by asking your questions using the contact form!